Luis Posada Carriles was declared guilty Tuesday of committing several crimes against Cuba and its people at a public trial held in Havana. The United States was also found responsible for having financed and supported his activities. Cuba had decided to try Posada in his absence after a US judge recently dropped immigration fraud charges and released the man widely considered the most dangerous terrorist in the Western Hemisphere. The verdict from the Anti-terrorist Tribunal came after ample testimony irrefutably demonstrated Posada�s guilt of terrorist crimes against the Cuban revolution and US government complicity. 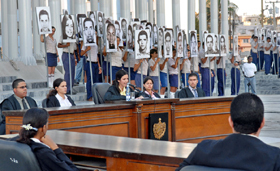 Iala Rodriguez Cruz, the tribunal�s president, recanted the different pieces of evidence showing Posada�s guilt and the state terrorism used as part of US foreign policy. Posada�s long record includes organizing the 1976 sabotage of a Cuban airliner off the coast of Barbados that killed 73 persons. He is also credited with a string of attacks on Cuban tourist facilities from 1997 to 1998, and several assassinations attempts against President Fidel Castro, including the one that would have killed hundreds and possibly thousands of people at the University of Panama in November 2000. Rodriguez said the US government protects Posada to keep him from revealing information about his past connections, commitments and ties in the carrying out of different terrorist plans in several countries. The White House, she noted, in conjunction with rightwing extremist groups in Miami, used legal maneuvers to charge Posada with minor immigration infractions and then press for his release. Venezuela has demanded Posada�s extradition to stand trial for the plane bombing and other crimes but the Bush administration refused to honor a longstanding extradition treaty with the South American country. Before the conclusion of testimony, Lieutenant Colonel Roberto Hernandez Caballero, a Cuban investigator, told the tribunal that evidence provided by Cuba about terrorist acts against the island have been repeatedly ignored by the US courts. As examples he noted that in a trial in the US over the hijacking of a Cuban plane flown to Florida, the jury declared the hijackers innocent despite clear proof of the terrorist nature of the crime. In another major case, five Cuban men known as the Cuban Five were found guilty of conspiracy and other charges in a Miami court despite widespread evidence presented by Cuba showing their innocence. The Cuban Five had gathered information about terrorist plots against the island planned by violent rightwing groups based in Florida. That information was then supplied to the United States government. However, instead of detaining the terrorists, the FBI arrested the informers. The case of Fabio de Celmo, an Italian tourist killed in one of the hotel bombings organized by Posada, was also discussed during the final day of the hearings. Giustino di Celmo, Fabio�s father, said the decision to free Luis Posada Carriles makes a mockery of Fabio�s memory and of Cuba�s victims of terrorism including 3,478 killed and 2,099 with severe disabilities. Present at the public trial in Havana were leaders of student and youth organizations led by Julio Martinez, first secretary of the Young Communist League.